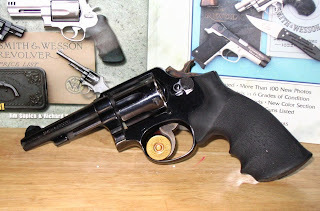 This is a Smith and Wesson Model 10-6 that I picked up a couple of years ago. Used of course as you can tell because it’s an older production weapon. One way to tell if this is a pre 1982 weapon is that the barrel is pinned in place. 1982 and on features “crush fit” barrels. The first version of this revolver was introduced in the very early Twentyth Century. For most of the Twentyth Century the “Military and Police” revolver in .38 Special was the standard police sidearm. It was used in both World Wars by the US and in World War II (in 38/200 caliber by the British. 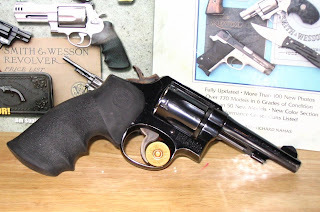 The Model 10 is still produced by S&W today. A lot of changes have been made in the 100+ years that this fine weapon has been made, but a police officer issued one in 1905 wouldn’t have any trouble picking up,loading, aiming, firing, and hitting his target, my version. My Model 10 has a pretty nice double action trigger as do all K frame Smiths. It’s very accurate, and with the Hogue grips, it’s comfortable to fire. It is in almost new conditions, with very little wear to the bluing, a tight lock up to the cylinder, and shoots very well. There is something to be said for this kind of boring dependability, accuracy, and craftsmanship. Now I’m wishing I hadn’t sold mine… :(Oh well, it’s a reason to buy another one, right?? ?